That's a pretty precise tight gap! Sorry for rehashing an older thread but I am fairly new to the forum. Can you take a older non slit, non SPI piston/cylinder set and shorten the piston and get the benefit that the SPI provides. I would just try it but I don't want to render a piston (in my limited stock) un-usable for something that may be pointless. I think non-slit, non-SPI cylinders are at least somewhat rare. They were used in QZ and QRC engines. I am all for experimenting, but if you just want SPI, it should be easy get a correct ready-made cylinder. Of course, trimming the piston skirt will make the piston lighter, and you may gain some rpm over a regular SPI cylinder. yeah, I think that was GermanBeez playing around. I haven't seen him in a LONG time. Same with nitroairplane, last I heard (several years ago now) his shed burnt down which had all his planes and engines in it. SkyStreak wrote: Sorry for rehashing an older thread but I am fairly new to the forum. My educated guess is yes. I think you'd get about the same performance as a slit exhaust with a short skirted piston. I think the location of the bottom of the old open exhaust port is the same height as the slit ports. It's been said by experts that I trust that the area of the old wide open ports was overkill, and the change to slit with its reduced open area caused no appreciable restriction. Plus you'd gain the benefit of a lighter weight piston, even without thinning its wall, as some tuners do. I might try shortening the piston skirt on one of my twin slit sets to see what that does. If one does not have access to a machine shop or equipment how would one accomplish shortening a piston with basic resources??? You could try wrapping tape around the piston and chuck it in a drill press. Use the tape edge to expose the metal to be removed, and carefully use a small file to skim it off. SkyStreak wrote: I might try shortening the piston skirt on one of my twin slit sets to see what that does. Here's a photo of a simple tooling setup that is pretty-much self-explanatory.. although I can't take the credit for the photo.. nor have I performed the procedure. 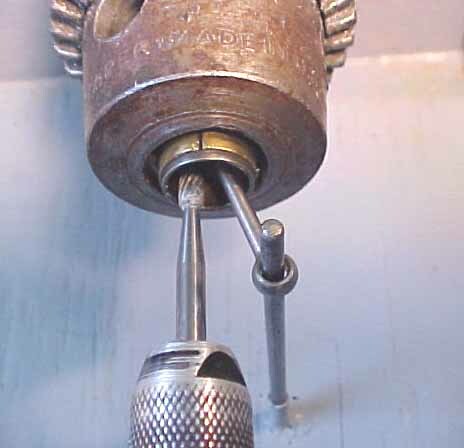 The piston is held in a chuck with the connecting-rod's eye "wired" to a stand-off out of the way. The ball-socket joint makes this possible. A rotary tool is then used to remove material from the piston-skirt. If desired; removing material from the inside of the skirt can result in "lightening" the piston without shortening the skirt.. BUT it's a precise operation that's impossible to perform accurately without the use of a lathe.. and precision measuring instruments. Shortening the skirt to add (or increase) sub-piston induction would again; require the use of a vernier/caliper to accurately measure "how much" of the skirt is being removed in the process. CEF 2017 Tach-Race link below..
That said; there's no harm in giving it a try with an old/worn-out piston and common shop-tools.. you "might" just be able to produce a high-performance engine! PlaidHatter wrote: That's a pretty precise tight gap! When reading this thread I moved the cursor by accident over the right side of your post and this red bar came up. Maybe Jacob can remove it. This was a unintentional maneuver!! This thread sure weaves in and out. Finding stand alone pistons to modify is a challenge. Only pistons I can find come with a cylinder. I had several spares when I started assembling engines from parts but ran out fast. Idk, to me it seems the subject of SPI to me is way overrated. The amount of piston gap at TDC is probably the least critical compared to compression, piston fit, etc. If you read Paul Gibeault's article on reedies, SPI is not even addressed. Mark Boesen wrote: Idk, to me it seems the subject of SPI to me is way overrated. The amount of piston gap at TDC is probably the least critical compared to compression, piston fit, etc. If you read Paul Gibeault's article on reedies, SPI is not even addressed. Ive read Paul's article several times. I have some cylinders that according to that article should be pretty good. I test front ends (crank, cyl, piston) with the same horseshoe backplate for consistency. So far I not getting the kind of numbers that apparently I should, so for me at least, I'm looking for missing links that will add up. I just want to learn how to build a hot little reedie for a R/C Quiky 200 type plane to fly for fun and impress my fellow fliers. Start with a dual port, preferably a Tee Dee cly., loose fit, tight ball socket, 35% nitro, new hicomp head. Start with 4 gaskets and remove until unable to needle. New reed, o-ring, make sure needle is tight. A lot of SPI vs. a little SPI won't help much if compression is off or bad cylinder fit, leaky needle, worn reed, etc. Then there's stuff like polishing crank, lightening, deck height, etc. Lots trial and error, you'll get there.